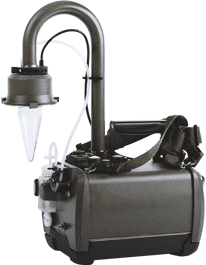 Coriolis RECON, a portable, light and ruggedized bio-air sampler, collects biological warfare agents in the air for detection during on-site operations. Biological warfare agents are a major global concern mostly because they are easy to manufacture, transport and disperse. Due to the time lag between a biological attack and the appearance of symptoms, the consequences of biological weapons can be devastating. Many diseases caused by biological agents (except toxins) are highly contagious, and during this time lag, infected persons continue to spread the disease, further increasing its reach. Hundreds or even thousands of people can become sick or die if a biological attack occurs in a major metropolitan area. Thanks to Coriolis Recon for the collection of airborne pathogens, the early warning, detection or identification of biological aerosolized weapon attacks is facilitated for military forces, first responders and civil security forces.